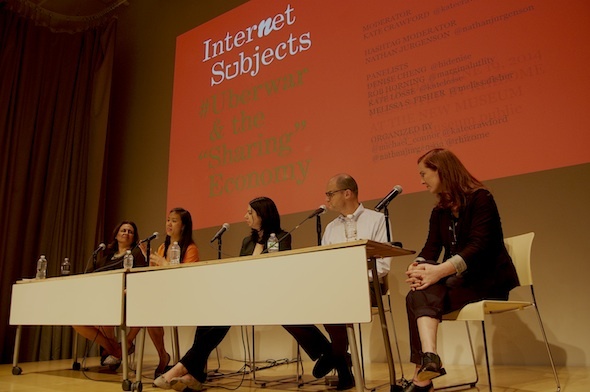 These questions were discussed in depth at Internet Subjects, a "flash panel" on the sharing economy last night, presented by Rhizome at the New Museum and trenchantly moderated by Kate Crawford. Here's what emerged. The use of the word "sharing" may reflect a broader push to frame commercial activity in altruistic terms. Melissa S. Fisher (Social & Cultural Analysis, NYU) tied the seeming idealism of the term to the recent rise of the benevolent corporation that understands itself as the new agent of social change. Writer Kate Losse also reflected on how these platforms are far more eager to describe themselves as vehicles for social good than as optimized private networks. As Rob Horning (Editor, New Inquiry) pointed out in his introductory remarks, "What sharing companies and apps chiefly do is invite us to turn more of our lives into capital and more of our time into casual labor." For Fisher, this can be seen as a shift by the corporation into traditionally feminized spaces; Cheng pointed out that this shift was not without precedent: many of the issues faced by sharing economy participants parallel those faced for many years by domestic workers. Panelists noted the various ways in which the term "sharing" most often means a systematic shift of risk from the service provider onto the precarious labor and consumer. On these platforms the "product" is the software, as opposed to the experiences that result in their use. Uber refers to their drivers as "partners" as a way to alleviate any inherent risks associated with assuming an army of full time employees, as Cheng pointed out. And Rob Horning reminds us, these independent contractors are the only ones who handle the risk of depreciating capital assets. Kate Losse noted that is tied to a larger Silicon Valley ideology that drastically privileges the technical work over the emotional or creative labor that form the end user content of the platforms themselves. If everyone is an entrepreneur, can there be worker solidarity? The workers who make up these networks have structural limitations to effective forms of resistance. Workers have little time to organize when they already have to work so intensely just to break even. Whereas factory workers could coordinate a slowdown, the sharing economy creates a distributed set of workers with little collective potential, prompting the panel to question the extent to which the freedom of "working whenever you please" weakens your ability to organize against an employer. Such networks are in effect anti-communities, as Horning asserted with dystopic alarm, where users and independent contractors are pitted against one another, with the only unifying aspect being their use of digital technology to seek the best opportunity to exploit each other’s labor for the lowest rate. But at what cost? The recent #uberwar protests were revealing. As unionized London black cab drivers withheld their labor in a massive organized action, Uber remained in prime position to capitalize upon the increased demand for alternative casual labor sources to fill the gap, only further illustrating how many sharing networks find opportunities to exploit even the most coordinated attempts at organized resistance with little more than a line of code. While we can "vote with our wallet" today, we approach the day when private networks completely replace public utilities and vast suppliers of middle class jobs. Just try convincing someone to send a letter via USPS rather than using gmail. What services will remain public goods in an age of private networked infrastructure? What problems will manifest when questions of liability, access, and ethics are no longer decided by the public, but by a small group of shareholders? Sharing economy evangelists frequently laud the "self-regulating" nature of the platforms (user ratings, feedback) but do we want to substitute this for the traditional levers of enacting change across public services? As the old saying goes, "you can’t fight city hall", but it may be even harder to fight Andreessen Horowitz. Too often these winner-take-all platforms "invoke change without actually doing much" sharing themselves, Losse added, suggesting that companies, as rational capitalist actors, should take user and worker criticisms to heart. Another possibility was raised by Cheng, who (citing Janelle Orsi) suggested that we should "buy back" Airbnb and other sharing services. While this might be difficult in practice, it does point to the fact that users of peer marketplaces, like traditional workers, might reasonably expect to earn equity in the network itself. But for now, there are few guarantees that the valuations of these companies will be shared by the networked independent contractors who performs its services, and scant hope for collective action. The final question of the night prompted the panel to think of a new term to replace the misnomer "sharing." "post-sharing," "sublet," "contingent," "casual," or the "gig" economy were among the suggestions to capture the new state of networked precarity. Yet a realistic (if not jaded) observer in the crowd hinted at the futility of compartmentalizing the digital network potential that lay beneath services like Uber and Airbnb. Her proposal was simply to refer to it as "the economy"— despite the dissections offered last night, it appears as if it's here to stay. And simply acknowledging these commodity relations as the new normal may be an important step toward a more equitably shared future. Internet Subjects is a new series of "flash panels," organized in one week in response to current issues. Sign up here to receive news about future events. It would have been interesting to include a business person in this discussion. Was that not considered or do the panel organisers not have the interest, or the access? As you may know, Rhizome works quite closely with many individuals in the tech business sector; in fact, my co-organizers Nathan Jurgenson and Kate Crawford are both researchers with roles in the tech industry. I'd imagine that future Internet Subjects panels will be structured more as debates, when that seems most appropriate, and will feature not just researchers, writers, and scholars, but business people and artists as well.